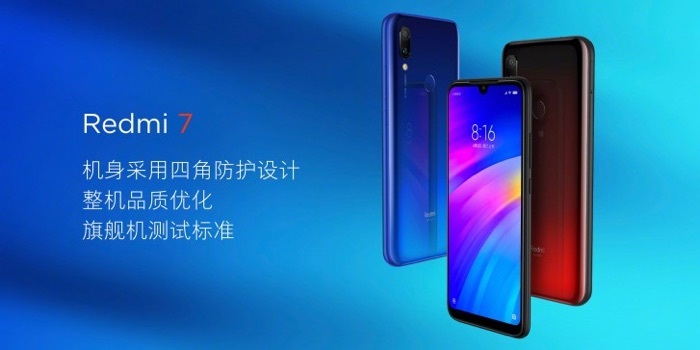 The Redmi 7 smartphone is now official, the handset comes after the recent launch of the Redmi Note 7. The Redmi 7 is equipped with a 6.26 inch LCD display that comes with a HD+ resolution and the handset is powered by a Qualcomm Snapdragon 632 processor. The handset will come with a choice of 2GB of RAM and 16GB of storage, 3GB of RAM and 32GB of storage and 4GB of RAM and 64GB of storage. The device also comes with a 4000 mAh battery and prices for the handset start at $105 for the 2GB model and go up to $150 for the 4GB model. The handset comes with an 8 megapixel front camera or Selfies and dual rear cameras. The dual rear cameras include one 12 megapixel camera and one 2 megapixel camera.